Written by Bo Li, Olan Scott and Jerred Junqi Wang. The Chinese Super League (CSL) is arguably one of the fastest growing professional leagues in the world. In the 2018 season, the league averaged 24,104 spectators per game, which made it one of the most attended sports leagues in the world. One strategy broadly utilised in recent times by most of the CSL clubs has been to invest significantly in the transfer market to recruit high-profile foreign players. Whether these investments will financially benefit the CSL teams in the future has yet to be studied. An soon to be published study by scholars from the US and Canada attempts to fill this gap by exploring whether investing significant amounts in the transfer market could contribute to increased game attendance in the CSL. Using the attendance data for three seasons spanning 2015–2017, the study revealed that investing in high-profile players both contributed to home game attendance and also boosted away game attendance. The results also showed that high-profile teams such as Guangzhou Evergrande as well as games with a special interest such as traditional rivalries (e.g. Beijing Guoan vs. Shanghai Shenhua) and derbies (e.g. Shanghai Shenhua vs. Shanghai SIPG) could produce positive impacts on game attendance for both home and away games. Following the release of a report titled ‘Opinions on Accelerating the Development of the Sports Industry and Promoting Sports Consumption’ by the Chinese State Council, the government has declared its aim to grow the sports industry. The goal is to reach a value of US$800 billion by 2025 and to increase the number of private, public and national sectors investing in Chinese soccer. Signing international star players and coaches has proven to be an easy way for clubs to grow. During the 2015–2016 season’s winter transfer window, CSL teams outspent English Premier League teams, becoming the top-spending league in the world. Unlike the American Major League Soccer (MLS) clubs, which mainly lure ageing stars such as David Beckham, David Villa or Frank Lampard, CLS clubs attract top players in their prime. Oscar, for instance, a former Chelsea midfielder from Brazil, joined Shanghai SIPG in 2017 as a 25-year-old. Star players have been shown to offer a significant contribution to the growth of the CSL. Another interesting finding from the study was that Guangzhou Evergrande, the most eye-catching team in the CSL, provided a major contribution to the growth of CSL game attendance in each of the three seasons. The team not only holds the highest average home team attendance figure (47,002 in 2018) in the league, but also contributes to its rivals’ attendance tallies. Results show that every away match played by Guangzhou Evergrande generated an additional 7,000 spectators. These findings illustrate that the influence of Guangzhou Evergrande for the CSL is invaluable. 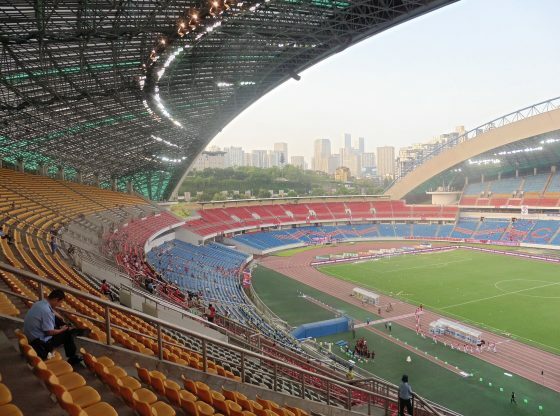 As the most successful soccer club in China, Guangzhou Evergrande dominates all competitions and also has twice been crowned the Asian Champions League winner. As a result, Guangzhou Evergrande is the most marketable team in the league. On the other hand, although transfer fees and annual salaries have been increasing dramatically, Chinese domestic stars do not seem to generate enough interest among fans for them to attend CLS games. The study showed that the number of high-profile Chinese players in a game, particularly national team players, has a negative impact on attendance. This may not be completely surprising since the Chinese national team has not achieved any major successes in international competitions since qualifying for the 2002 FIFA World Cup. The team has not qualified for the last four FIFA World Cups and its international ranking fell to its lowest in history – 109th place – in March 2013. Therefore, CSL fans may not value the performance of national team players in the league. Journalists on Chinese domestic media channels have often criticised the CSL for being dominated by foreign players. The only domestic player to be in the top 20 scorers of the league was Wu Lei. However, with Wu joining Espanyol FC (a team in Spain’s national Liga) in 2019, the CLS needs to find new domestic stars to generate fans’ interest. Although the academic study provides evidence that recruiting high-profile stars is a successful strategy for boosting game attendance and interest, the massive transfer fees spent by club owners and the high salaries for both foreign and domestic players pose serious questions about the overall sustainability of the league. The accounting firm PwC released a report which showed that CSL clubs had a combined debt of more than US$594 million in 2017. To address this concern, the Chinese Football Association (CFA) has gradually implemented a salary cap and other new rules to enhance clubs’ financial stability. For example, in November 2018, the CFA introduced measures to curb spending among CLS clubs. The new rules specified that the spending cap for top flight teams will be US$176.5 million in 2019, reducing to US$161.8 million in 2020 and US$132.4 million in 2021. The CFA also requires that spending on player salaries by CSL teams must not exceed 65 per cent of their total expenditure in 2019. The introduction of these new regulations sets three questions for future studies: 1) Will they succeed in strengthening the financial stability of CSL clubs? 2) How will the regulations impact on clubs’ future investment in foreign players? 3) Will there be an impact on the quality of the CSL as a result? As for the answer to these questions, we will have to wait to find out. Bo Li is an Assistant Professor in Sport Management at St Ambrose University and a fellow of the China Soccer Observatory. The focus of his scholarly interest is on how social media have been utilised by sports media outlets, sports organisations and athletes to engage with audiences. Olan Scott is an Assistant Professor in Sport Management at Brock University. His main research, particularly into sports media, focuses on mainstream media and fans’ engagement on social media. Jerred Junqi Wang is an Assistant Professor in Sport Management at the University of West Georgia. His research focuses on branding, sport market demand and sport analytics. Image Credit: CC by Jack Tanner/Flickr.